Since becoming vegan, I’ve decided that I really like tempeh. The first time I tried it was back when I was testing the waters of vegetarianism, and then I wasn’t so sure. I think the first thing I tried putting it in was vegetarian chili, and the earthy taste didn’t work out so well. Then again, I also wasn’t familiar with the idea of mellowing tempeh before tossing it into recipes. Now though, I’m a pretty big fan of the stuff. I like the various marinated types from Veganomicon, love Robin Robertson’s tempeh tantrum burgers, and have been known to use it as the main component in faux tuna melts. Looks innocent enough, right? 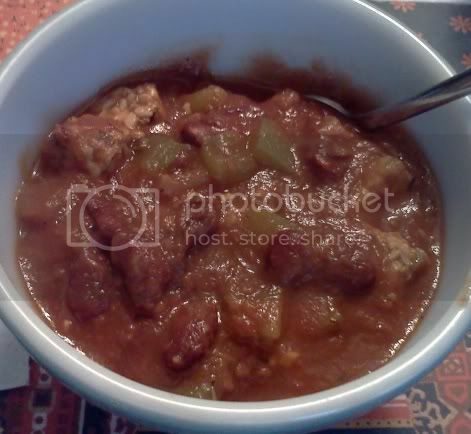 Onions and green bell pepper floating in a thick, tomato-y sauce amidst red kidney beans and hearty chunks of tempeh. Tasty stuff. But the true secret of this jambalaya is soaked chipotle peppers. Yep, chipotles. Two of them. I found a jar of the dried kind in the bulk section of the local co-op and, since I’ve read several recipes including them and enjoy them in salsa, grabbed a few to try. If you’ve never come across these before, let me tell you how wonderful they smell. Every time I opened the cabinet where I was storing them, an amazing smokey smell wafted out. It was easily one of the best food purchases I’ve made in a while. As part of the jambalaya, you’re supposed to soak two of these neat little chiles in hot water for 30 minutes, presumably to make them easier to chop. 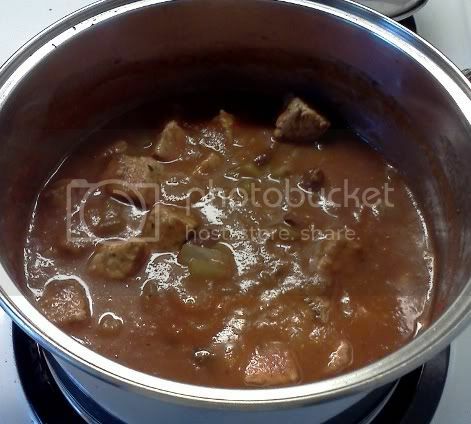 Then you cook everything else in a big pot, browning chunks of tempeh in a separate skillet in the meantime. I discovered the joy of tempeh chunks in particular as part of a cold salad that the co-op does on occasion–soba noodles with kale and marinated tempeh triangles–so I knew I’d like them in this dish. Once browned, you dump them into the jambalaya and let everything cook. Just a tip…if you put chipotle chiles in something and the recipe mentions cayenne as an optional seasoning, skip it. That is, unless you want your lips to leap off your face and take a vacation somewhere cooler. Another thing I tried for the first time with this recipe was filé powder. Apparently it’s made from ground sassafras leaves and turns up in gumbo quite a bit. It’s one of those ingredients that I’d read about but never bought. I’m starting to realize just how handy it is to be able to buy bulk spices in that kind of situation. When it’s possible to get just one or two small scoops of a spice that I don’t plan to use a lot of, I’m much more inclined to pick some up. With the filé powder, I’m glad I did. It added a nice thickness to the finished jambalaya. Question for the comments: What ingredient(s) do you often hesitate to buy because you’re not sure you could ever use it all?